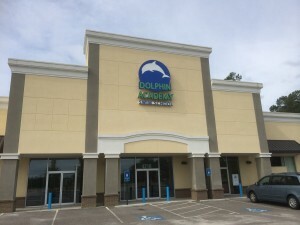 The Dolphin Academy is housed in a 7,000 square foot custom-designed, indoor facility located at 4216 Washington Road, right beside Academy Sports, in Evans, Georgia. Our aquatic facility features a 75’ x 32’ heated pool, heated family changing rooms, a climate-controlled viewing area, and is the first indoor pool in the CSRA dedicated entirely to swim instruction. Additionally, the swim school provides a state of the art UV water purification system, as well as a dehumidification system to maintain optimal water and air quality for all participants. For driving directions to the Dolphin Academy, please click on “Directions” on the map below.